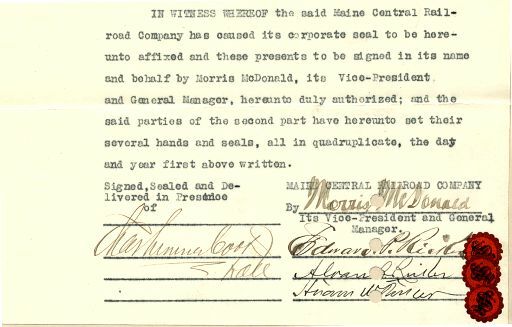 Agreement (3 pages)for the Maine Central Railroad Company to purchase all of the the stock of the Hiram Hotel Company signed in 1911. This item has the signatures of the Company's Officers including Edward Ricker, Alvan Ricker and Hiram Ricker and is over 97 years old. 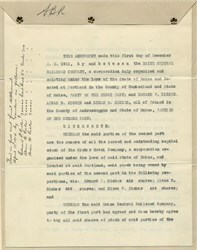 Signature Page In 1859, Hiram Ricker built a crude log spring house over a water source, and made his first commercial sale of a container of the water, a 3-gallon demijohn he put on the Portland stage for 15 cents. Subsequently a father brought his supposedly incurably ill daughter to drink from the spring. Twelve-year-old E.P. Ricker brought her a 3-quart pail of mineral water direct from the spring, and the following day she was well enough to return to Portland. Dr. Elephelet Clark continued having her drink water from the Poland Spring, and the girl was to live more than 40 years longer. The doctor became convinced of the mineral water's medicinal value. In 1860, Hiram set up resident sales agents in Boston, and as the fame of Poland Spring water spread, orders came from as far away as the South and the Pacific Coast. In two years, sales increased to 1,000 barrels. Hiram turned the property over to his eldest son, Edward P. Ricker, then 22, in 1869, and the latter immediately began to develop it. Many people came to the spring itself for a cure, and in 1869-1870, the Rickers had to enlarge the old inn, adding another nine-room story to the building. In 1870, they shipped 5,000 barrels of Poland Water. Originally the Rickers had dipped water from a 5- or 6-quart basin carved out of the rock. In 1872, they enlarged the stone basin to a 30-gallon capacity and bailed water out with a pail. In 1872, increasing patronage forced them to demolish the woodshed and cider house behind the old inn and build a seven-room addition to the building in their place. The inn came to be called the Mansion House. Alvan Ricker, the second son, joined the firm in 1875, and in 1876 a man named Albert Young, of Auburn, became a partner. The firm built at the crest of the hill a large four-story frame hotel called the Poland Spring House, which featured a six-story tower at one corner. The building extended 200 feet wide across the front and had 100 rooms. It superseded the old Mansion House, but the latter continued to operate as an economy hotel compared with the elegant, first-class Poland House. Hiram Wentworth Ricker, a third son, joined the firm in 1880, and in 1881 the Rickers bought out Young, established the firm of Hiram Ricker and Sons, Inc., and spent $20,000 improving both the interior and the exterior of the posh Poland House. Within 3 more years receipts had doubled, and sale of spring water increased about a thousand barrels per year, grossing $3,000 in 1883. In 1883 and 1884 the Rickers enlarged the Poland House by 64 rooms and a music hall, and the Mansion House to a total of 66 rooms. ln 1887, they built an annex to the Poland Spring House featuring a billiard hall and another 24 rooms, made other miscellaneous improvements, and enlarged the stable built in 1825. In 1889 the company added yet another 50 guest rooms to the Poland House, again remodeled the rest of the building, and relandscaped the grounds. The year 1893 proved a banner year for the Ricker firm--for Poland Water won the Grand Prize for mineral waters at the Columbian Exposition in Chicago, and in Poland, Maine, the firm added a south wing to the Poland House featuring 20 bathroom suites. In 1894, the firm built a southwest wing that included a photographic studio and darkrooms available to guests who were amateur photographers. More notable, that year the company purchased the Maine State Building from the Chicago Fair for $30,000 and paid $3,000 to have it disassembled, loaded, and moved by a 16-car train to Poland, Maine. There workmen reassembled it in front of an oak grove beside the hotel to serve as a library, museum, and art gallery, where it still stood in 1988. On August 21, 1894, the stable burned to the ground, killing 27 horses and destroying all the harness, robes, coach equipment, and other tack. The Ricker firm scraped together enough equipment to haul 70 people the next day, and in four days had replaced all the horses and equipment lost in the disastrous fire. In 1894 and 1895, the Rickers erected over the site of the burned stable a 152-foot-wide new stable with two wings, a steel roof, and a carriage house with sleeping rooms above. By the end of the century, the Rickers had added a nine-hole golf course, later extended to 18 holes. Devotees of tennis found a tennis court on which to play. The hotel added one of the first automatic sprinkler systems in a New England summer resort. Soon it featured telephones in every room. Some rooms had bathtubs with three faucets: hot water, cold water, and Poland Spring mineral water, for those who wished to bathe in it. A firing range accommodated guests who liked to shoot. A 500-acre farm and a 125-acre kitchen garden supplied produce to the hotel. Peas alone occupied 5 acres, and the farm and garden also had 3,000 tomato plants and grew cucumbers, cabbage, beets, lettuce, Swiss chard, and radishes by the ton. A hotel dairy farm kept 100 milk cows as well as other herds. Additionally, the hotel purchased produce from Shaker farms in the vicinity. The Shakers kept Rhode Island Red hens, which supplied eggs and poultry, and they also raised 250 hogs for the hotel. At the resort itself, meanwhile, Hiram Ricker and Sons further enlarged the Mansion House and added a bathhouse. In 1912, a stone All-Souls Chapel was erected near the Maine State Building. The resort continued to prosper in the Edwardian Age in America as it had in the Victorian. History from the National Park Service.